The shape of steel...the beauty of leather. 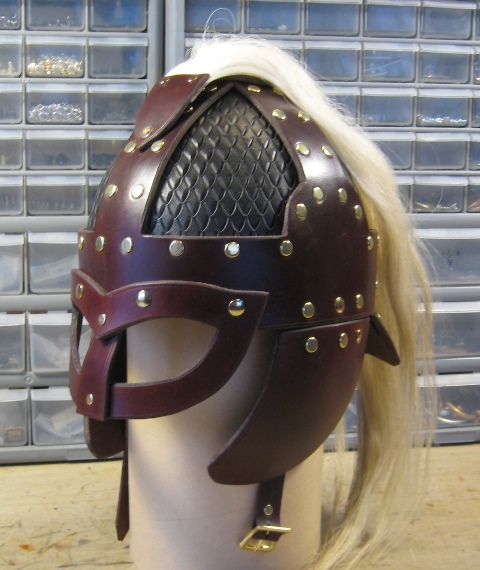 Leatherhelms helmets are riveted, four panel helmets, made of heavy saddle leather. They are precisely cut and molded into curved shapes, then hardened, using the cuir bouilli method. They are then buffed with beeswax as a preservative, and given a final coat of acrylic to make them water resistant. So…how does this website work? Buy a ready-made helmet or you can design your own helmet. You purchase the Basic Helmet, and then purchase the parts you want to add. Begin by simply clicking on “Build Your Helmet” under Helmets. Ships within a couple of days. Our joy is making medieval renaissance helmets all by hand just for you. Lords of Leather has been creating hand made leather products for a long time. You can find us at several of the Midwest Renaissance Festivals and Faires. Lords of Leather has acquired Leather Helms. We're excited to keep the Leather Helms tradition of excellence alive and well. © 2018 Lords of Leather ~ Leatherhelms. All Rights Reserved.